If you've noticed a lack of tequila drinks on our blog it's because neither Brian nor I drink much of it. Oh, we like the taste just fine but it does tend to hit us much harder than other liquors. With Cinco De Mayo coming up, though, we figured the holiday was worth a true margarita. Of course, when I say "true" I mean it's gotten the Hungry Couple cocktail twist. We couldn't just present a typical margarita. After all, you can get that anywhere. So after some exhaustive (and tipsy) recipe testing, we've come up with something a notch above. Maybe even two notches above. Cheers! Prepare your glass by rubbing the rim with a piece of cut lime. Then dip the rim of the glass in a shallow plate of sea salt to coat the edge. Place glass in freezer to chill. Combine all the ingredients in a blender filled with ice and blend until the ice has broken down. Pour into the chilled margarita glass and place in the freezer for a few minutes to firm up, if desired. Garnish with a wedge of lime. It is unusual to use that kind of fruits for cocktail. Am I right? Happy Cinco De Mayo for sure!!! What a fun margarita flavor. Very springtime bbq appropriate. The color is so playful! yum! I love margaritas....and this one is perfect for the summer with all the fresh watermelon!!!! I love it that you buckled down and did all that extensive testing so we wouldn't have to. I raise my glass to you guys! Yes yes and yes!!! I'm so sad I just used up all my watermelon. These will have to wait until the weekend. The whole idea of blended watermelon and tequila has won me over. I will need to try this slushy goodness and soon, thanks for posting this one! Tequila is actually my fav, so I'm excited to see this recipe here! Oh wow, I would love a virgin version of this! Beautiful presentation. The watermelon sounds so refreshing. O man... I love margaritas!! Loved the kicked up watermelon twist! This looks SO good! Need these for saturday!! 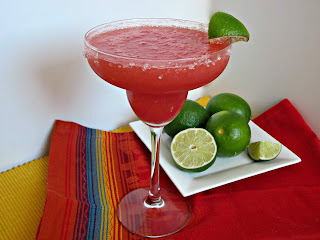 I love margaritas, and when they have a red neon color I love them even more!! What a fantastic margarita! I love anything watermelon and this would definitely fit the bill for me. Saving to try soon! I am a tequila girl all the way and this looks so fantastic! Is 11:00 too early to start? 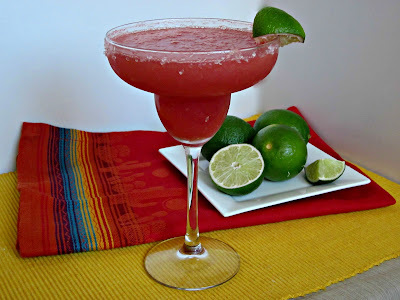 I love the idea of watermelon margarita! So refreshing! Oooh, I definitely need to try these! My favorite summer drink is a basil watermelon martini -- the margaritas would be a great alternative. Yummy. I don't drink much but I suppose I could do this virgin. It's so pretty. Yum Yum!!! Can't wait to try this! !